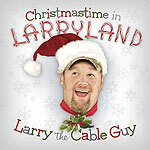 CD review: "Christmastime in Larryland"
Note to Larry the Cable Guy: When you have to resort to a laugh track on a comedy album, you're reaching. No one will be more disappointed in this flat, unfunny holiday effort than longtime fans of the blue collar comedian. From tired jokes we've already seen recycled on the Internet to radio skits that just don't work, this has the feel of a forced recording rushed to market to cash in on holiday fever. His third comedy CD in the last two years, not counting his contributions to the Blue Collar Comedy Tour CDs and DVD, and his second Christmas CD (following 2004's "A Very Larry Christmas"), "Christmastime in Larryland" suffers from a severe lack of good material. The concept has promise  an old-fashioned radio program  but the weak writing dooms it. Normally a very funny man with a keen ability to skewer political correctness on both sides of the cultural aisle, Larry just isn't up to form here.